If you’re looking for a friendly place to share a few tandas to celebrate hump day, join us in our lovely studio in Angel! 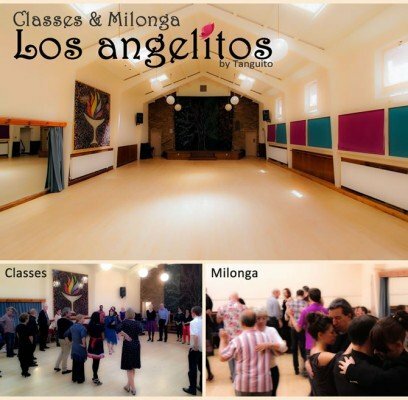 You can join the classes or just the milonga. When: EVERY week EXCEPT as mentioned below. Argentine tango London | Tanguito tango studentsWatch out, our passion for tango is contagious! Classes are all followed by a milonga (social dancing) – in a beautiful hall and London’s friendliest settings! Complete beginners: you can join the beginner class and stay a bit longer for the social dancing, or alternatively, start with a private lesson to ease your way into classes! All classes are drop-in without booking. No experience and no partner is needed. NOTE: LOS ANGELITOS will run as part of the CHE LONDON festival, on 02.05 and 03.05, in the evening (9.30pm - 2.30am). PRICE: 1 class: £12 | 2 classes: £16 | Milonga only: £6. NOTE: Milonga is free if it’s your birthday! :-). DISCOUNT: If you pre-pay for group classes, you’ll be in for a nice discount.